ONCE, viewed from those movie-star houses high in the Hollywood Hills, the orange ball-shaped signs of Union 76 service stations floated like glowing citrus across the Los Angeles basin. At dusk, the slowly rotating balls looked like pushpins on a map of the city. Now the orange spheres are winking out, one by one. A corporate image-changing program by ConocoPhillips, which owns the Union 76, Phillips 66 and Conoco brands, is replacing the balls with flat signs as part of a new standardized design for Union 76 service stations. The 7.5-foot polycarbonate ball, created for the Union 76 exhibit at the Seattle World’s Fair in 1962, was designed by Ray Pedersen of the Young & Rubicam advertising agency. 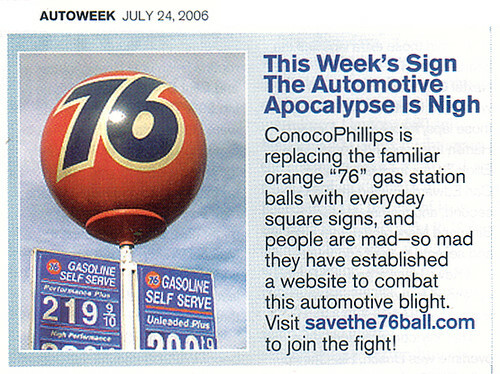 Two California design buffs, Kim Cooper and Nathan Marsak, have created a Web site (savethe76ball.com) to push for preservation of the orange icon and have begun a petition campaign to save some of the signs. Mr. Pedersen, 80, who heard Ms. Cooper speaking on a radio program, has joined the effort. Michael Madsen, the actor best known for his role in the film “Reservoir Dogs,” supports their cause, as does the Society for Commercial Archaeology, an organization devoted to roadside architecture. “We are trying to engage them in dialogue to save a few,” Ms. Cooper said in an e-mail message. 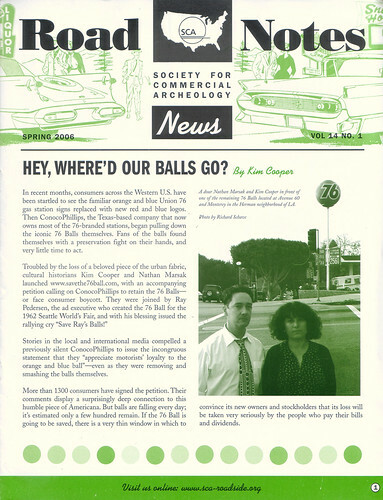 “But from our observations, it seems like the remaining Hawaiian balls have been switched off, while a small percentage of the U.S. balls continue spinning, especially along the La Brea Boulevard corridor.” She said there were once about 400 Union 76 balls in the Los Angeles area. Smaller versions of the orange ball are still available — the ones that attach to automobile radio antennas. Union 76 gas stations began handing out the mini-spheres in 1967, and they can still be bought online at happyballs.com.